The next day, the news that Jesus was on the way to Jerusalem swept through the city. A large crowd of Passover visitors took palm branches and went down the road to meet him. They shouted, "Praise God! 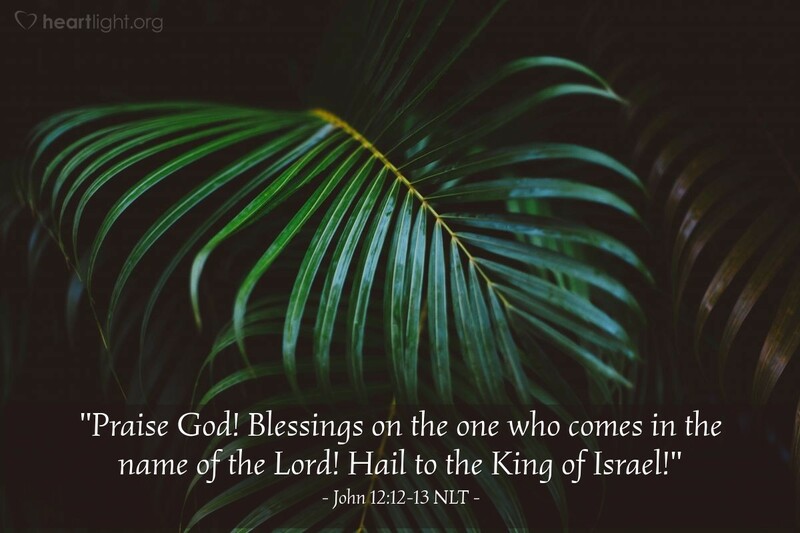 Blessings on the one who comes in the name of the Lord! Hail to the King of Israel!" The people hope Jesus is their conquering savior sent to deliver them from the Romans. They hail him as the great King David's heir. Jesus, however, identifies with the servant and peaceful Savior of Zechariah's prophecy. He comes as a peacemaker, not as a warrior on a conquest. When he refuses to be the conqueror and submits to arrest and torture, the crowds who hailed him one week earlier are gone and the crowd that cries, "Crucify him!" replaces them. If Jesus is to be our Savior, he must also be our Lord. We come to him on his terms, or we miss him and miss the peace he came to bring to us. Holy God, my Abba Father, thank you for sending Jesus to be our mighty Savior and humble Servant King. Help me understand all that this means, and empower me to follow him no matter the cost. In Jesus' mighty name, I pray. Amen.